In honor of the endless leftovers and turkey sandwiches being consumed today, allow us to introduce you to a proper Thanksgivingy masterpiece. 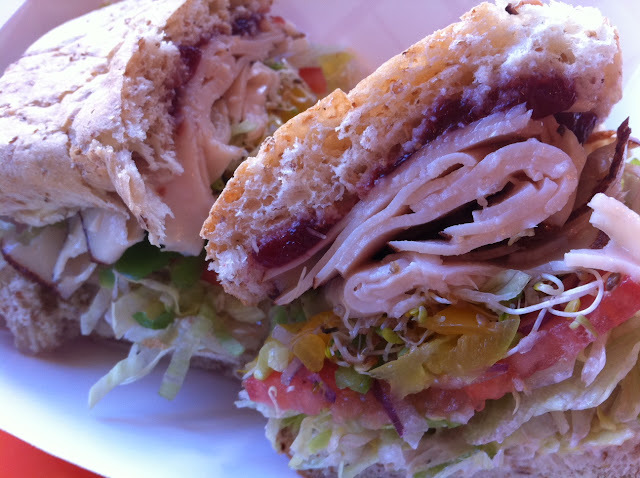 The Rave, ordered here on a whole wheat sub roll, is packed with sliced turkey, cranberry sauce, provolone, sprouts, tomatoes, lettuce, green bell pepper, sunflower seeds, red onion, horseradish and hot pickled peppers. It is outstanding, vinegar-spicyness and nostril-burning horsey action mingling with fresh vegetable crunch and sweet-sour crantasticness. It is a bite of beauty and definitely our favorite Thanksgiving tradition buster. Johnny McGuire's continues to consistently amaze.